Summer is a busy time for construction in Michigan and we all need to contend with alterations in our usual routes when we encounter “road closed” signs. Peregrine falcons have their own ideas about re-routing air traffic around their offspring. There is a Great Blue Heron that flies through downtown on morning and evening commutes, so this is an avian neighbor that the Peregrine falcons have seen many times. Great Blue Herons are wading birds that dine on small fish and frogs that they pluck out of the water. Peregrine fledglings would not be on their menu. However, one evening, both Rebecca and Kewpee took offense when the Great Blue Heron flew too close to one of the fledglings. They both went into attack mode and it was not looking very good for the heron for a few minutes. Peregrine falcons are not the only cool come-back birds living in Kalamazoo. Another large raptor that has made a comeback after being severely affected by DDT are Osprey and several nests have been seen near the Kalamazoo River in recent years. Osprey are also known as Fish Hawks since their diet consists of fish and they typically nest close to a body of water. It is not unusual to see one in the distance or flying near downtown. The Peregrine falcons and Osprey have been neighbors for quite some time and Osprey are much larger than the Peregrines. However, one Osprey chose an unfortunate shortcut and Mama Peregrine decided it was a bit too close to her youngsters. 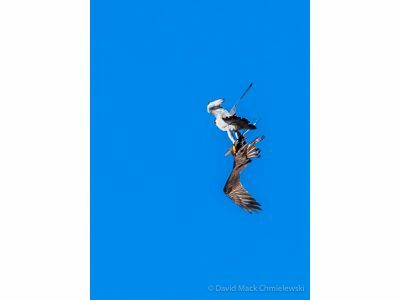 An Osprey would not be interested in picking on a young Peregrine falcon, but Rebecca was taking no chances and, as Dave C observed, “escorted the Osprey into the next area code, missing a few tail feathers.” Dave caught some interesting photos of the encounter that you can see in the gallery. Both the Osprey and the Heron did fly away and have chosen different commuting routes since their skirmishes with the Peregrines.